Dr. Dorritie was previously involved in laboratory research focused on the development of novel therapeutic agents for acute myeloid leukemia. More recently, she has shifted her focus to the development of early phase clinical trials in hematologic malignancies, in particular lymphoid malignancies. She is a member of the UPCI Cancer Therapeutics Team. She has played a key role in the development of the chimeric antigen receptor (CAR) T-cell program and serves as lead or co-investigator on several clinical studies of CAR T-cell therapy at UPMC. Dr. Dorritie has also been working to develop a stem cell transplant program for patients with hemoglobinopathies, including sickle cell disease. Dr. Dorritie teaches a number of didactic lectures for both medical students and fellows and serves as a block director for the MS2 Hematology course. 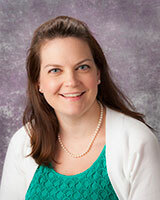 She teaches clinically on the leukemia, stem cell transplant, and malignant hematology consult services. Dr. Dorritie’s clinical interest is in hematologic malignancies and hematopoietic stem cell transplantation. Dr. Dorritie has been involved in laboratory research focusing on the development of novel therapeutic agents for acute myeloid leukemia. Her lab work focuses on targeting the JAK-STAT pathway, a pathway implicated in a variety of malignancies, including acute myeloid leukemia. More recently, she has become involved in the UPCI Cancer Therapeutics Program, with a focus on developing early phase clinical trials in lymphoid malignancies. She has a particular interest in high risk B-cell lymphomas. Dr. Dorritie also teaches a number of didactic lectures for both medical students and fellows and teaches clinically on the leukemia, stem cell transplant, and malignant hematology consult services. Im A, Amjad A, Agha M, Raptis A, Hou JZ, Farah R, Lim S, Sehgal A, Dorritie KA, Redner RL, McLaughlin B, Shuai Y, Duggal S, Boyiadzis M. Mitoxantrone and Etoposide for the Treatment of Acute Myeloid Leukemia Patients in First Relapse. Oncology Research. 2016; In Press. Salomao M, Dorritie K, Mapara M, Sepulveda A. Histopathology of Graft-versus-Host Disease of Gastrointestinal Tract and Liver: an Update. American Journal of Clinical Pathology. 2016; In Press. Lim SJ, Lim MJ, Raptis A, Hou JZ, Farah R, Marks S, Im A, Dorritie K, Sehgal A, Agha M, Lim SH. Outcome of acute myeloid leukemia patients with pulmonary nodulesof uncertain etiology receiving allogeneic hematopoietic progenitor cell transplant. European Journal of Haematology. 2016; 96(1): 55-9. Lim MJ, Stebbings A, Lim SJ, Foor K, Hou JZ, Farah R, Raptis A, Marks S, Weber D, Im A, Dorritie K, Sehgal A, Agha M, Lim SH. IV pentamidine for primary PJP prophylaxis in adults undergoing allogeneic hematopoietic progenitor cell transplant. Bone Marrow Transplantation. Bone Marrow Transplantation. 2015; 59(9): 1253-5. Lim SJ, Lim JF, Raptis A, Hou JZ, Farah R, Marks SM, Im A, Dorritie K, Sehgal A, Agha M, Felgar R, Lim SJ. Inferior outcome after allogeneic transplant in first remission in high-risk AML patients who required more than two cycles of induction therapy. American Journal of Hematology. 2015; 90(8): 715-8. Dorritie KA, Redner FL, Johnson DE. STAT transcription factors in normal and cancer stem cells. Advances in Biological Regulations. 2014; 56: 30-44. Padilla-Nash HM, Hathcock K, McNeil NE, Mack D, Hoeppner D, Ravin R, Knutsen T, Yonescu R, Wangsa D, Dorritie K, Barenboim L, Hu Y, Ried T. Spontaneous transformation of murine epithelial cells requires the early acquisition of specific chromosomal aneuploidies and genomic imbalances. Genes Chromosomes Cancer. 2012; 51(4): 353-74. Dorritie K, Montagna C, Difilippantonio MJ, Ried T. Advanced molecular cytogenetics in human and mouse. Expert Review of Molecular Diagnostics. 2004; 4(5): 663-76. Ried T, Dorritie K, Weaver Z, Wangsa D, Difilippantonio MJ, Montagna C. Molecular cytogenetics of mouse models of breast cancer. Breast Disease. 2004; 19: 59-67.